Highway thru hell is a TV show. It is aired at the Trinity Broadcasting Network. The TV show highway thru hell comes up every Monday at 6-8 p.m. in the evening. The channel is 98 and runs 24 hours a day 7 days a week. Highway thru hell is a TV show that talks about our life styles here on earth. This TV show was started six months ago by a Pastor. The reason he started the show was to help redirect people to the right track. Because according to him many of us have missed the mark. Going to church has become a ritual. That the church has become like any social group that people go, make fun, and make merry. They do not take anything serious. He says a big no to that. He says that the church is supposed to be a place where we go and learn good morals and not the revise. That some churches do not even talk about this at all since they are afraid to loss their members. What they know how to talk about is prosperity. That prosperity gospel is not going to take us anywhere. And that all the we have acquired will remain here on earth. The only thing that we will take to heaven is our soul. So why not teach people to prepare their souls for heaven rather that focusing on earthly things that will perish and pass away. All of these earthly possessions are vanity. Highway through hell focuses on the fact that we are strangers here on earth. And are just passing by. Our destination is heaven. This world is not our home. So we should do everything in our power to focus on heaven. The presenter says that, we should not put all of our minds on the creatures and forget the creator. Rather, we should focus on both. The Quiring family work together to lift a semi back on it's wheels; an original member of Jamie's towing family starts to feel the physical and mental toll of heavy rescue. Jamie calls in his brothers Jason's rotator to tackle a recovery in the Canyon; the Mission towing team juggles a lost load of telephone poles; emergency responders race to a crash on the Coq involving one of Jamie's crew. Tough times in Alberta force Colin to weigh his future; the Mission towing crew races to clear a wreck that's shut down the rail line outside Hope, BC. Al Quiring is pulled into a muddy war to rescue a pair of 40 ton excavators buried in a bog; Jamie and Scott are called to a mysterious wreck in The Canyon. Rookie prairie tow operator Jonny Tipton faces his toughest recovery; Gord clashes with stubborn drivers on the Coq and reveals a lifelong personal battle. On the busiest travel day of the year, Al works to clear a burning tractor trailer off the Coq; Colin is sent to rescue a delivery truck loaded with Christmas presents in Alberta. Gale-force winds sends a semi airborne and wreaks havoc on Jamie's operation in Hope; Al and Gord try to recover a massive mining truck. Jamie's team deals with a jackknifed semi-trailer on the edge of a bridge; Mission Towing races to finish a recovery and open the road. Mission Towing races to an urgent call on a logging road; Jamie deploys his "air bag" recovery system to flip a tractor trailer. Jamie battles a truck fire on the Coq and reveals big changes to his operation. Jamie takes control of the rotator for the first time in months, and turns to his competition for advice about a major decision that will determine the future of heavy rescue. As Jamie reaches a difficult crossroads, he looks back over four seasons, revisiting his most challenging wrecks. Also, a look behind the cameras and faces from past and present explain what drives them to this dangerous world. Al and Gord gamble on a job which pushes both wreckers to the limits. In Alberta, Jamie's crew battles a whiteout. Back in B.C., a wrecker is called in to help solve an underwater mystery. A simple job turns urgent which forces Jamie back out on the road; An overturned truck is trapped under it's load of steel. The Davis and Quiring families team up for a rare joint recovery; a big rig is left teetering in a seemingly impossible position. When recovery crews team up for a massive wreck, a close call leads Brandon to reconsider his future in the business; attempts to straighten out a jackknifed truck get twisted. A downpour of freezing rain covers Hope and the Coq, crippling Jamie's operation. Meanwhile, Ken heads to a job and re-lives the worst day of his life. Episode 5 - Wreck. Recover. Repeat. Al Quiring races to open the Transcanada before the morning rush; a semi carrying a load of pharmaceuticals plunges down a bank; in Alberta, the burdens of running the shop solo takes a toll on Colin. A semi plows off a bridge. John must prove himself and get holiday traffic moving on a multi part recovery. Colin faces the biggest recovery of his career. Al Quiring faces bad snowstorms on the Coquihala. John faces off against a mangled tractor. Jamie's new B.C. crew struggles with a mangled trailer on a blind corner; when Colin slips up on a big recovery in Alberta, Jamie's brother must take over the job, even though he's a rookie on the rotator; Brandon steps up to a new role. A snowplow is pulled from the river; Colin takes on a new role; a Heavy Rescue legend leaves the group. Highway Thru Hell is currently available to watch and stream on Discovery Channel. 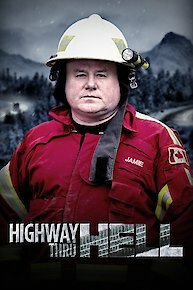 You can also buy, rent Highway Thru Hell on demand at Netflix, iTunes online.